If there’s one thing that can truly give your home the WOW factor, it’s a glass roof. Not only are they visually stunning, they can transform your home, thanks to the natural light they bring in, often making your space feel larger than it is. So could a glass roof be right for your home? Whether your doing an extension, or just a renovation, you might be considering this impressive feature. However, there are many things to consider when it comes to glazing your roof. On average, a glass roof will set you back between £900 - £1,200 per m². Prices can vary massively, depending on where you live and the type of glass ceiling you’re after. One thing you can say for certain, a glass addition is going to require a much bigger budget than a classic brick and slate roof. If you’re trying to keep costs to a minimum, consider getting a uPVC or metal frames. Frameless glazing requires structural glass, and is therefore very expensive. However, frameless does tend to look better and will add more value to your property than cheap looking uPVC. If you're scratching your head, ask your architect for cost effective, but stylish, solutions. As with all home projects, you’ll need to make sure proper consideration has been made from the structural integrity of your space. This is a legal requirement, set out in UK building regulations, and must be undertaken by a qualified structural engineer. You’ll need to let your structural engineer know whether or not you’ll be using frames, or structural glass in your ceiling. Both will require your engineer to calculate what reinforcement will be needed in your existing wall. They’ll work out exactly how much steel will be needed to create supporting piers, and will typically assess the ground conditions to see if it's stable enough for your design. If not, your engineer may require additional underpinning of your home, to provide better structural support. No one wants to be staring up a dirt and leaves, so how do you keep your glass ceiling clean? This is something you’ll need to consider before investing. Are you prepared to get up there yourself? Would you mind paying a professional to come round on your behalf? If you do decide to do your own cleaning, make sure you don’t make the mistake of actually going up and standing on your roof. This is very dangerous, and can easily be avoided by using the right extending sponges. Want to avoid cleaning all together? You can purchase self-cleaning glass. Yes, you read that right. This glass is coated with a special substance that keeps your glass spotless all year round. It works by using the heat from the sun to activate the cleaning process, breaking down any dirt present, then when it rains, all that filth is washed away. Genius, isn’t it? Of course, self-cleaning glass does come with a higher price tag, so you’ll need to see it as a worthwhile investment. Solar Control: this is the one you should seriously consider. By having a glass ceiling, you run the risk of having your space over-heat in the summer, as those solar rays come beaming in. Solar control will keep the light pouring in, but not the heat. Privacy: this treatment means that you can see the sky, but your neighbours can’t see you. 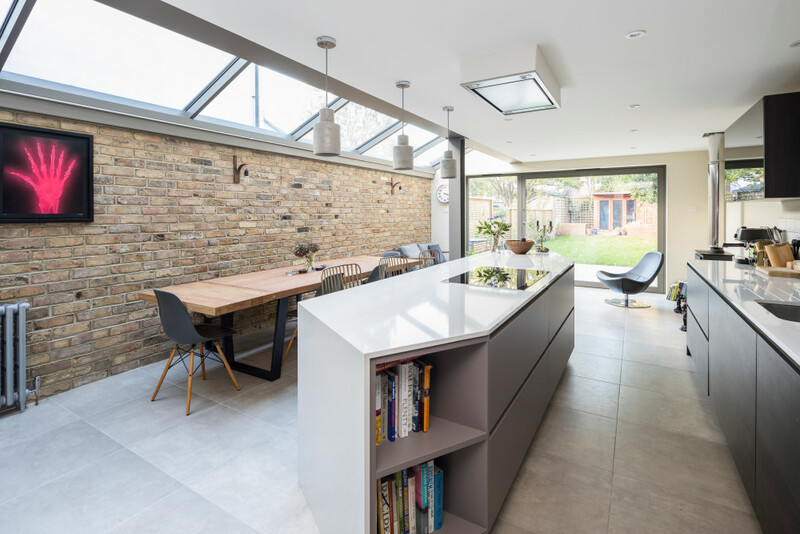 This is perfect if you’re considering a glass roof in a densely packed area, such as London. Heated: live somewhere prone to snow? If you’re building up North, you might consider heated glass. Heated glass uses electricity to keep your structure warm, melting snow, and eliminating condensation. It can also be used as an added heat source, perfect for high ceiling properties. How much glass will you use? Do you want a glass ceiling running down the side of your house? Covering the whole thing? The more glass you envision, the bigger your budget will need to be. You’ll also need to consider planning permission. Alterations that dramatically differ from the exist building’s aesthetic can face rejection, especially those involving listed buildings or those in a conservation area. Your planning officer will also be considering the impact on privacy, so if you’ve got people overlooking your home, you might want to include privacy glass in your application. Want to know more about budgets, planning, and building regulations? We offer free consultations for all homeowners. Why not grab some free advice today?